It is life … But not as we know it. The latest addition to our family is making her presence known. Where once there were pirates … there is now pink. In all its’ myriad shades. Cerise frilly pants, candy floss miniature tutus (what self respecting three-day-old would be without?) and Pepto Bismol bedroom bunting. We are in shock. Rose and peach have replaced khaki and camouflage, and minute ballerina slippers have slipped seamlessly onto a shelf next to mud caked football trainers, and their ubiquitous smelly sock soul-mates that flop out of the top – ready for the next foray onto the pitch. We are unprepared for this onslaught of girlish things. We are not sure how to react to these additional unexpected colours in our rainbow. But we are also in love. So vast was the surprise that the newest member of our family is a girl, we are still getting used to saying ‘her’ and ‘she’ but it doesn’t matter. The big man of the house still has watery eyes when the word ‘daughter’ is mentioned, and the little man of the house just keeps informing us that she is gorgeous … just gorgeous. And she is. In her honour, darling little cupcakes are delivered, heavenly chocolate confections from friendly neighbours and hospital picnic lunches arrive on a daily basis. I was even the recipient on Sunday of the lightest, most mouth watering scones I have ever eaten. Laden with thick cream and blueberry jam, and warm out of the oven from the other side of Singapore … it was delivered in person by a lovely man with a quiet, but enormous talent in the kitchen. And the best part … apparently I am allowed to eat all of them. New mothers need to keep their strength up don’t you know. In honour of the new colours in our lives I purchased an inordinately expensive bunch of Rainbow Chard at the organic supermarket today. The clashing leaves and stems, the iridescent shades of fuschia and orange with their verdant veined leaves get me every time. And I haven’ t seen them for a while – two years to be precise. Armed with a couple of Chinese New Year Mandarins (present in every home in Singapore at this time of year), a box of Italian Pappardelle and my bunch of chard I set to work. A simple supper for my newly grown family. 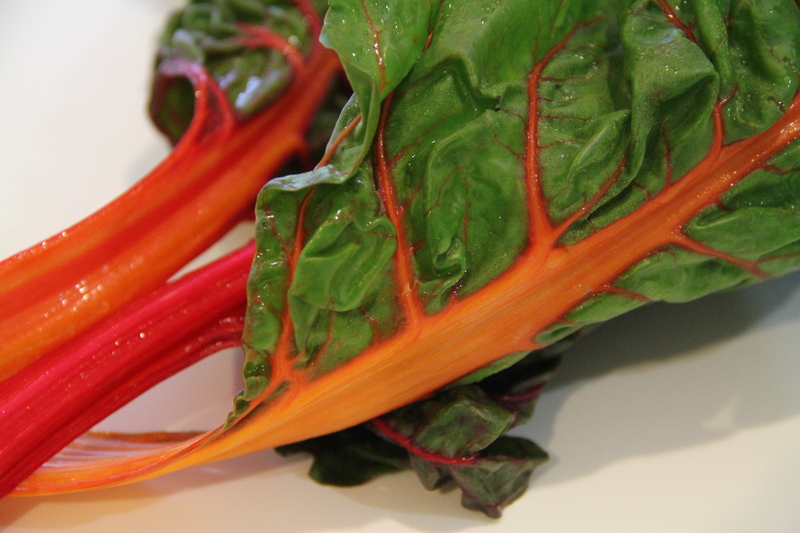 Clean and prepare the chard by washing thoroughly under running water. Remove the leaves by tearing them away from the stems, using one hand to drag the leaf away while holding the stem with the other. Finely slice the stems (removing any very battered or brown bits), and then widely shred the leaves. Using a bain marie (or simply a small saucepan over larger one half filled with simmering water on low flame), place the egg yolks and butter in the top pan, and place above steaming, just bubbling water. My favourite tool at the moment is a multicoloured silicone covered whisk – a present from a husband making up for spending weeks away at a time in Seattle (gifts from Williams Sonoma make up for a lot). It is perfect for this job as my pan is ‘nonstick’ and it doesn’t scratch the coating, as well as being light and fine, so that it is easy to use for long periods of time; such as making hollondaise – where you have to be constantly agitating the mixture. Almost as soon as the butter starts to melt, add a tablespoon or so of the citrus juice. Keep stirring as the sauce begins to thicken and add the juice a spoonful at a time until the mixture is a lovely light viscous texture. If you end up with any lumps just pass the sauce through a sieve. If you get really unstuck (or more to the point stuck) take the mixture off the heat, introduce the pan to a cold bowl of water to stop the thickening, and blitz the lot with an immersion blender. Set the sauce to one side, turn off the heat, add the salt if necessary and cover to keep warm. Bring a small amount of water to the boil in any large (wide but not deep is fine) pan with a pinch of salt and throw in all the chopped chard stalks and shredded leaves. Put a tightly fitting lid on the pan and allow about five minutes to cook/steam. Do not let the water burn dry or you will ruin your dish. Remove the lid, test that the chard is cooked (leaves wilted and stem still has a little bite – but ‘al dente’ not ‘al denture’ as my sis would say)! Toss out the excess water and pour on a good dose of the best olive oil you can lay your hands on, stirring to coat all the leaves and stems well. Put the chard to one side, again with lid on to keep warm. Place a large vat of water on the stove and bring to the boil. Salt the water and add the pasta. Cook until done. Eat some. It is the only way to know. 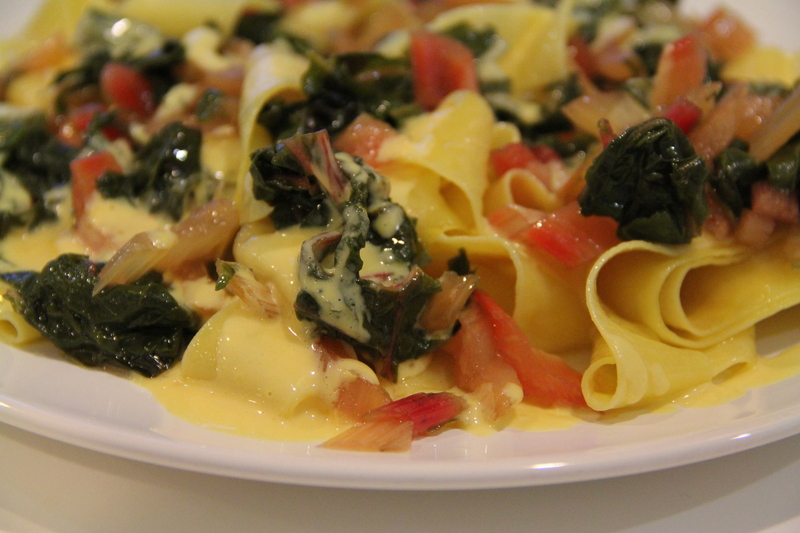 Drain the pasta, slug on some more olive oil and add the chard, combining ingredients gently and evenly. Check for seasoning and plate up. Pour generous amounts of the orange sauce over the pasta at the table. Devour. Mrs Leaver – this blog is too good to be left dangling… please, new musings! Congratulations Laura! Happy to read that your baby arrived safely. With very best wishes, Gill. Looks and sounds delicious! How I would love to be in Singapore to enjoy all aspects of your rainbow! Big hugs to the blokes an even bigger one for you and a wrap around wee Dot! jillox BTW..good one Rachel. You know when Hawaii sleeps!